Thanks to our low overhead (no storefront), you'll find our prices are well below those of most of our competitors. 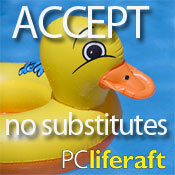 You can't buy more experience for the money than you'll get with PC Liferaft. We try to keep our services on a flat-fee schedule when possible so you'll know exactly what to expect. When we do work by the hour, we charge in quarter-hour increments with a one-hour minimum. (general rate for working on issues that do not have "flat fee" pricing). Website Design: quoted per job based on number of pages, graphics, etc. For payment, we accept personal checks (please make payable to "PC Liferaft"), Paypal, or credit cards through Paypal (you do not have to set up a Paypal account if you use a credit card). We don't love computers. We love what they help us achieve. All rights reserved. © 2009 by pcLiferaft LLC, 711 Signal Mountain Road #151, Chattanooga, Tennessee 37405. Questions or comments? 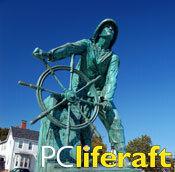 E-mail webmaster@pcliferaft.com or call (423) 208-9695.